Till now I believe that you are familiar with android view like TextView,EditText,Buttons etc. Now we will develop some application that will do sometthing useful. Note: all the permisssion are declared in manifest file. Now create a new Project and start. Second EditText to enter the SMS Body. And A Button to Send SMS. 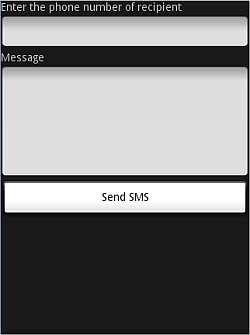 To send an SMS message, you use the SmsManager class. Unlike other classes, you do not directly instantiate this class; instead you will call the getDefault() static method to obtain an SmsManager object. The sendTextMessage()method sends the SMS message with a PendingIntent. The PendingIntent object is used to identify a target to invoke at a later time. For example, after sending the message, you can use a PendingIntent object to display another activity. In this case, the PendingIntent object (pi) is simply pointing to the same activity (SMS.java), so when the SMS is sent, nothing will happen. The above code uses a PendingIntent object (sentPI) to monitor the sending process. When an SMS message is sent, the first BroadcastReceiver's onReceive event will fire. This is where you check the status of the sending process. The second PendingIntent object (deliveredPI) monitors the delivery process. The second BroadcastReceiver's onReceiveevent will fire when an SMS is successfully delivered. Hope You Enjoyed it . Comments and Questions are welcome.